Great Savings coming your Way! Berlin has so many great places to stay and one of our favorites is The Berlin Grande! If you are attending one of our magic shows, you can save 15% on your entire stay! Inform the receptionist that you are attending the Magic Show and they will apply the savings when you check out. 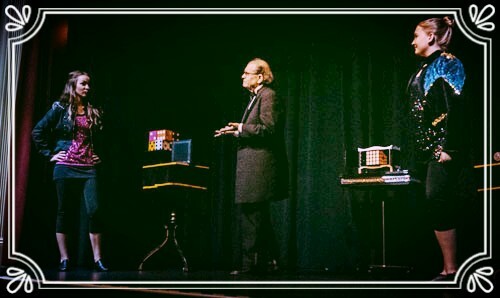 This package is the perfect gift for a delightfully entertaining, family-friendly magic show! Here's how the package works: You must buy a minimum of 10 tickets, either adult or child, in order to receive the discounted prices and receive an adult ticket free as our custom birthday gift package!! The adult free ticket is the chaperone ticket for birthday groups of children 12 years old and under. Here are the discounted ticket prices: Adult tickets are $22 each and children 12 years old and younger are $9 each. Be sure to provide us the name of the birthday boy or girl prior to the show and we will be sure to bring him or her on stage for one of our tricks. Parties must be booked for regularly scheduled shows. Remember our theater has limited seating of 49, so be sure to schedule your party well ahead of time to be sure there is plenty of seating and give your birthday person the experience of a life time! Receive 10% off group tickets of 15 or more! When you purchase your tickets online, the discount will be applied automatically at check out. A minimum of 15 to receive the discount.